What is the AWOC for? AWOC(the Akkeshi Waterfowl Observation Centre) was set up as a facility for studying and monitoring waterfowl as well as deepening people's understanding about conservation and wise-use of Lake Akkeshi - Bekanbeushi Marsh which became a Ramsar Site in 1993. Situated of on the first floor is an exhibition room and a lecture theater. It is possible to observe what is happening on the Marsh via a large screen whose image is relayed by observation camera. Furthermore, photographs, explanation panels and 3-dimensional models serve to instruct visitors in manners and rules of the marsh. 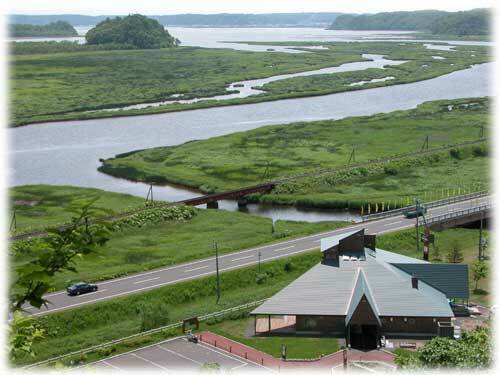 On the second floor is an observation corner from which one may appreciate the spectacular sight of the mouth of the Bekanbeushi river as well as Japanese Crane and many seasonal birds breeding.